↑ Rawlinson, Hugh George. (1950) A Concise History of the Indian People, Oxford University Press. p. 46. ↑ Muller, F. Max. 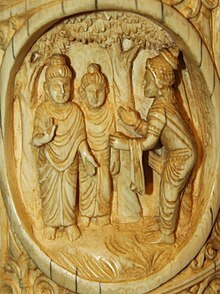 (2001) The Dhammapada And Sutta-nipata, Routledge (UK). p. xlvii. আইএসবিএন ০-৭০০৭-১৫৪৮-৭. ↑ Stearns, Peter N. (2001) The Encyclopedia of World History, Houghton Mifflin. pp. 76-78. আইএসবিএন ০-৩৯৫-৬৫২৩৭-৫. ↑ Eck, Diana. (1998) Banaras, Columbia University Press. p. 45. আইএসবিএন ০-২৩১-১১৪৪৭-৮. ↑ Luniya, Bhanwarlal Nathuram. (1967) Evolution of Indian Culture, Lakshmi Narain Agarwal. p. 114. ↑ Krishna, Narendra. (1944) History of India, A. Mukherjee & bros. p. 90.